Sony Will Show More PS Vita Games "When The Time Is Right"
Sony’s press conference at this year’s E3 was lacking one vital thing – PS Vita games. They managed to show a logo for Call of Duty: Declassified and a nifty little trailer for Assassin’s Creed: Liberation, but we never got to see how those games actually look like when running on the system. SCE CEO Andrew House has said that they will show more about these games “when the time is right”. Earlier Shuhei Yoshida, Sony WWS president, had said that they had a lot of Vita games on the show floor, but couldn’t show them at the conference due to lack of time, and both these executives have come up with an excuse which involves “time”. I hope they know that time is actually running out for this amazing system as far as third-party support and market penetration is concerned. However, he did say some things that can be taken positively. “So if we were remiss on not spending enough time on the PS Vita, I’ll take that one under advisement, but you can rest assured it’s not for the want of any sense of overall commitment,” he said. 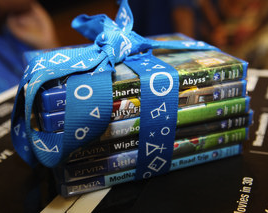 Let us know if you were disappointed with Sony at E3 2012 in the comments below!